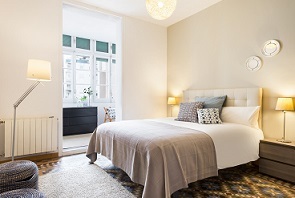 The Valencia Street and Paseo apartments are in an excellent neighborhood - nice, safe, centric -, very close to both the Sagrada Familia and upscale shopping on the Passeig de Gracia. At walking distance to many sights, shopping, and restaurants, and also next to the metro and bus stops, and a taxi lane on the same street. 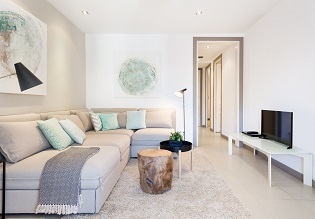 Wireless internet access, elevator, air conditioning, fully equipped kitchens in all apartments. BARCELONA APARTMENTS - Valencia building on the right, Paseo building on the left. 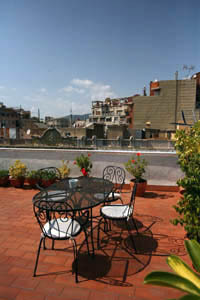 Big, sunny rooftop terrace with views and several tables for the use of our guests. 6-be 3-bathroom apartment with independent a/c, heating in every bedroom. Sleeps 12 (11 in beds). Sunny, great views. Air conditioned 2-bedroom apartment. Sleeps 5 (4 in beds). Original mosaic floors. Glass-enclosed balcony. Air conditioned 2-bedroom apartment. Sleeps 5 (4 in beds). Ceilings with original moldings. Air conditioned 2-bedroom apartment. Sleeps 4 (4 in beds). Original woodwork and mosaic floors. Very quiet and sunny air conditioned 2-bedroom apartment with enclosed porch. Sleeps 6 (4 in beds). Air conditioned 2-bedroom apartment. Sleeps 4 in beds. Original mosaic floors and balcony. Alternatively, you can send us email to apt@negre.us . USE THE BUTTON ABOVE TO PAY WITH PAYPAL, WHICH ACCEPTS CREDIT CARDS. 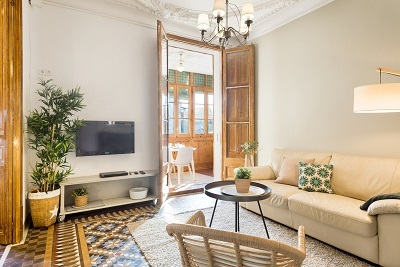 Barcelona apartments for rent. Holiday flats in Barcelona. 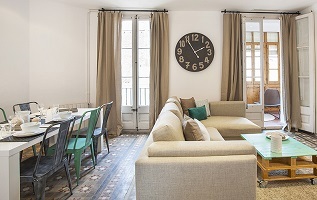 Self-catering rentals in Barcelona. 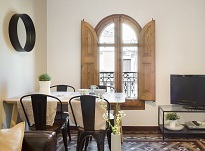 Vacation rentals in Barcelona. Apartments with roof terrace. 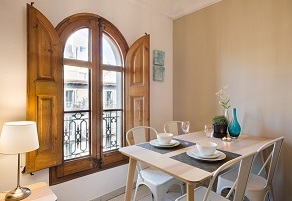 Eixample rentals. 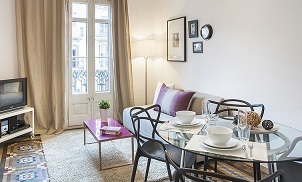 Quality apartments for short-term rent in Barcelona.